Since January I've made a lot of small changes in the setup of the Laphriini Pages that I've been meaning to document. Most are ongoing parts of more extensive changes that haven't yet been fully implemented. For example, I plan to fix any reference in the bibliography that has an on-line PDF or HTML version, to show a link to that version. With this, my bibliography will become a "one-stop-shop" for North American Laphriini literature. You will be able to look at the title, look at the annotation if there is one, or look at the original article or book, if it is on-line. I've added links for 59 of the 211 references. Many of the links are to page readers for large depositories like Biodiversity Heritage Library and HathiTrust. Others are to on-line PDFs. When I've added a link, I've also made it a point to annotate the reference, if it wasn't annotated already. As another example, I plan to fix most of the photographs so that you can click on them to get the original, usually much larger version. This linked photo will expand in a window up to its original size, if the photo is smaller than the screen resolution, and to fit your screen, if the photo is larger. In the last several years wide flat-screen monitors have become commonplace for desktop computers, and with this pop-up feature you can see more detail if you are using one of these monitors. Ditto if you are using a laptop (many people are now using a laptop as their principal computer). I've been adding these pop-ups as a matter of course in the blog for a while now. I've decided I will now be adding them in the main pages. The photos for the species treatments, however, are already large enough to be adequate, if not optimal, so these will be done last. So far I've added photo pop-up additions in the introductory pages for Laphriini and for Laphria s. str., as well as for miscellaneous new live shots in the species accounts. Part and parcel with adding links to these enlarged photos, I will both re-take some photos (if possible), as well as add new ones. Once again, I've done some of this, but still have much to do. In particular I added three completely new photographs to the introductory page for Laphria s. str. I've reproduced these here below, along with their captions. The photos here are less wide than their counterparts on the introductory page, so as to fit within the blog bounding box, if the blog is viewed at a resolution of 1024x768 (unfortunately at higher resolutions this reduction makes the photos look rather small). The backgrounds of the visible photos have also been tinted to match the background of the blog; the larger pop-ups, in contrast, have the original white background. The first two photos are comparison shots of presumed mimics with potential models. The very first is a shot I've been wanting to take for a long time, showing the oddball Laphria saffrana along with its presumed model, a queen Vespula squamosa. The fly and wasp have much the same southeastern distribution, the same phenology, and fly somwhat similarly to each other. BTW, if this is mimicry it is just of the queen. The worker yellowjackets are much smaller than the queen and have a different color pattern. Presumed mimic Laphria saffrana on left, with presumed model, a queen Vespula squamosa, on right. Laphria saffrana is limited to the southeastern United States; Vespula squamosa is found throughout that range but has a broader distribution. Laphria saffrana has a unique and very distinct color pattern among North American Laphria; no other North American species looks like a wasp. 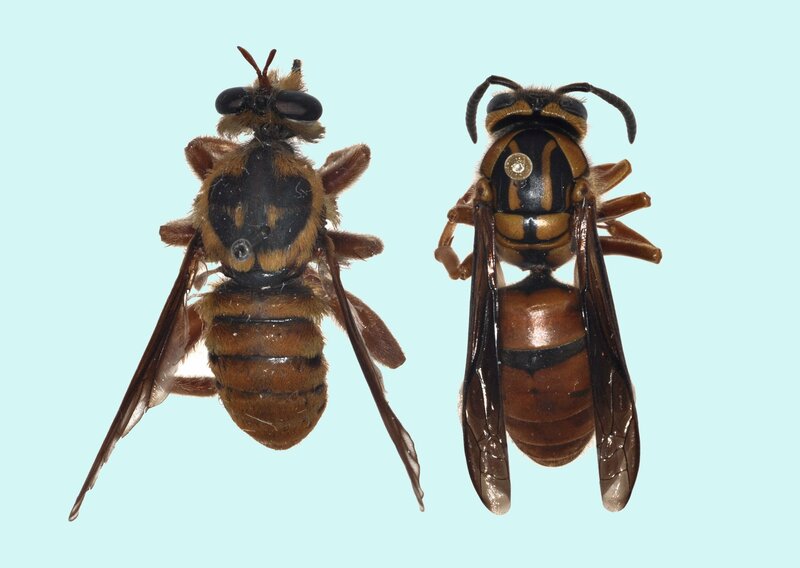 Note that if this is mimicry, it is limited to the queen of V. squamosa; the workers are much smaller and have a completely different gesalt. The syrphid Milesia virginiana is another southeastern fly that possibly mimics V. squamosa. The second shot is of a more typical, bumblebee, mimic. Here, though, it would probably be better to say that the model is only one of several, and not the most important; that is, the two pictured insects are part of a "ring." The bee (a cuckoo bumblebee) is probably too uncommon to be considered as the principal model. The third shot is also of a likely mimic, but without a model, as a representative of those Laphria s. str. species with a slighter build, that probably mimic andrenid or digger bees. 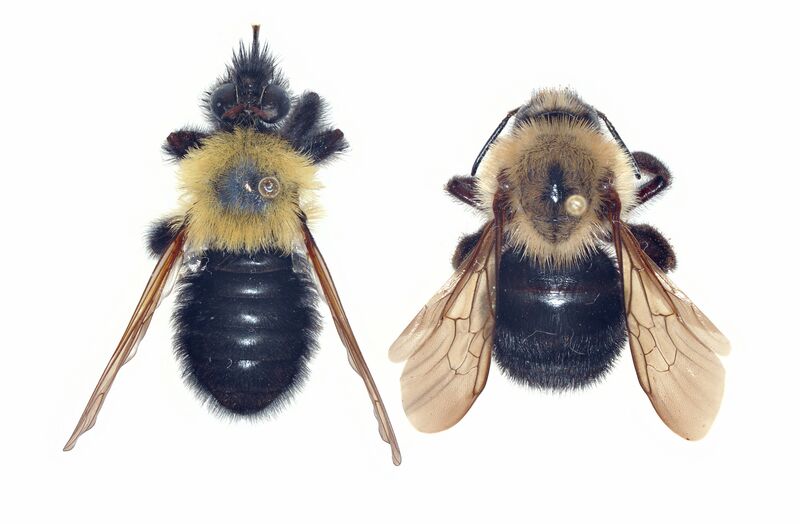 Presumed mimic Laphria thoracica female on left, with presumed model, a queen Bombus citrinus, on right. This cuckoo bumble bee, which used to be placed in the genus Psithyrus, is found in the northeastern United States. 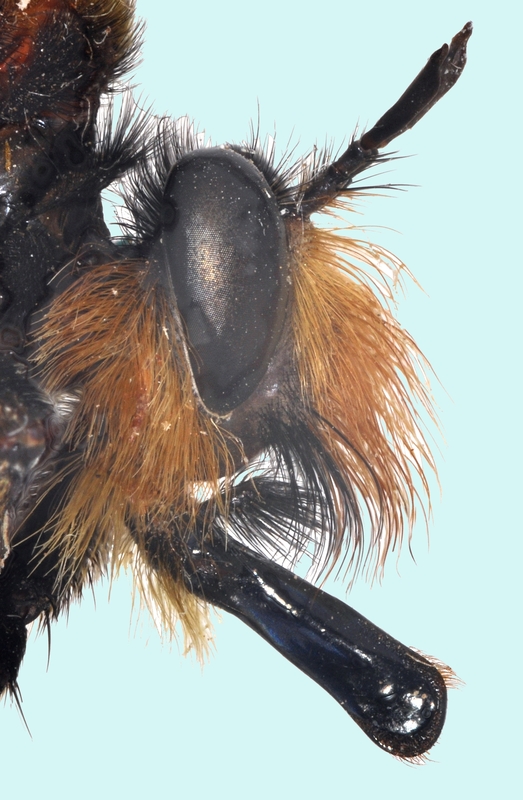 This particular color pattern is only one of several variants in Laphria thoracica. Laphria thoracica is one of the most bumblebee-like Laphria s. str. in the eastern United States. Laphria sacrator and another, undescribed species (photo at top of [Laphria introductory] page) are equally bumblebee like. Male of Laphria flavicollis, with legs and one wing spread and abdomen extended. The antennae on this specimen are not visible because they are pointing straight up. An example of a photo I've replaced is the one for the head of a true Laphria, again on the Laphria introductory page. As previously, this shot and its caption is reproduced below. BTW, this particular shot is of the head of Laphria grossa. To me, at least, one of the most remarkakable things about robber flies is their development of a stout proboscis, in conjunction with an active lifestyle and a large overall body size. I think of all robber flies, this development of the proboscis may have been carried furthest in big Laphria s. str. like this one. I hope that this photo gives some idea of its impressiveness. Business end of a big Laphria. The extraordinarily stout proboscis is characteristic of this genus. Note the obvious palp between the mystax and the base of the proboscis. 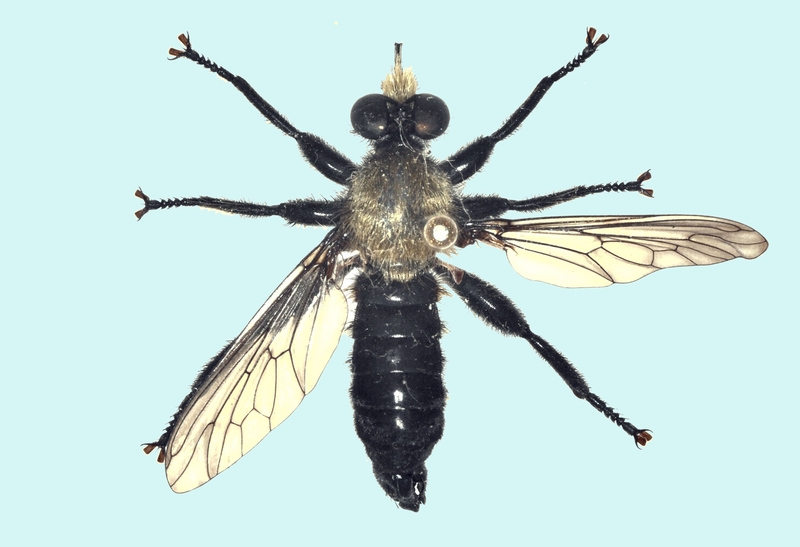 As an aside, the reason Laphria like this look hunchbacked, at least in cropped head photos, is that when they die, the head is reflexed with respect to the thorax, much as is the case with fossil birds and small bipedal dinosaurs, and one would think at first for the same reason, namely the contraction of doral neck muscles. Because of this flexure, to get a side shot of the head with the eyes facing forward, as when the fly is airborne, the body has to be oriented at a considerable angle. Hence the hunchbacked look. However, in life, at rest, as for example on a horizontal surface of a fallen log, and more particularly in the smaller species when sitting head-down on the trunk of a tree, the head is also equally strongly reflexed. In fact, this reflexed position might be considered normal. Much else has happened since January that will affect both the content and apprearance of these pages. I'll cover those developments in future posts. As for new collecting finds or photographs, I don't have any, for a combination of reasons. First, it's been an extremely cool spring and summer, and overcast and wet, too. Although I've run my Malaise trap when I've been home my asilid catch has been miniscule. Even Laphria like hot, sunny days. Second, I haven't been home to run the trap as much this year as during the last two. That's because I haven't taken my vacation yet. A lot's been going on at work I didn't want to miss.